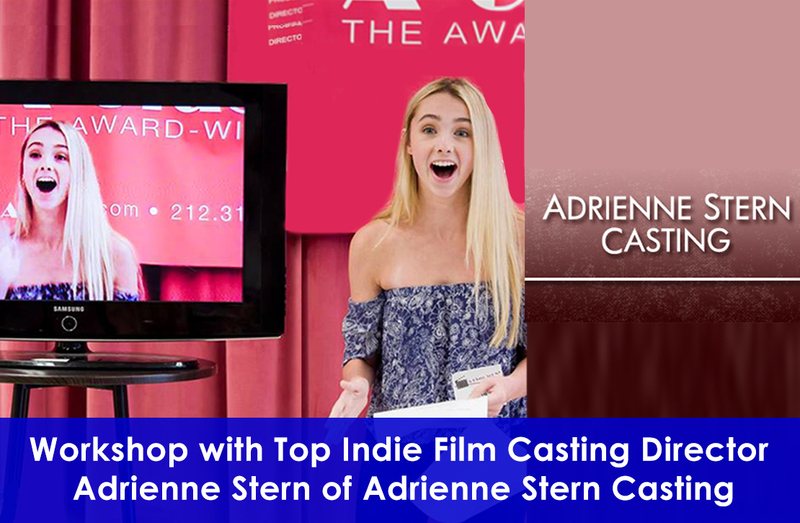 Don’t miss out on this amazing opportunity to work with Indie Film Casting Director, Adrienne Stern of Adrienne Stern Casting! She’s also worked in television casting too! With top agency and management relationships, Adrienne Stern is known for working closely with Directors and Producers to secure the types of casts that open doors to major film festivals and distribution packages. Her films have premiered at Sundance, Toronto, Cannes, Tribeca, Berlin, South by Southwest, Seattle and many other prominent film festivals, many taking home prestigious awards. Some recent and current projects include Pulitzer for PBS starring Live Schrieber and Tim Blake Nelson, STUDIO VISIT starring Tania Raymonde and Patti Lupone, ALEPPO Starring Letitia Eido, AMISH WITCHES THE TRUE STORY OF HOLMES COUNTY FOR LIFETIME. DISCOVERY INVESTIGATION VILLAGE OF THE DAMNED, I WITNESSfor The Discovery Channel ABC, KEEP THE CHANGE winner of the 2017 Tribeca Film Festival, DEMENTIA 13 the remake of Francis Ford Coppola’s original film which will open nationwide distributed by Universal, CSA Artios for YOUTH best short film 2017, Coming Soon THE FIRST (The Mary Pickford Bio Pic), and AWOL, EYES, and SEVEN LOVERS were all released in 2016/2017. Past films premiering at The Sundance Film Festival include BROKEN ENGLISH (directed by Zoe Cassavetes, starring Parker Posey and Drea de Matteo), ADRIFT IN MANHATTAN (starring Heather Graham and Dominic Chianese), THE IMMACULATE CONCEPTION OF LITTLE DIZZLE,(starring Natasha Lyonne), GIRLSTOWN (starring Lili Taylor), THE BELIEVER (starring Ryan Gosling), THIRTEEN CONVERSATIONS ABOUT ONE THING (starring Matthew McConaughey and John Turturro), WHATEVER, ONLINE, BLEACH, and THIS REVOLUTION. Television credits include the New York casting for THAT 70’s SHOW, where she was responsible for casting Ashton Kutcher, WELCOME TO GREENPOINT for FX and COPSHOW running now on L/Studio and starring Colin Quinn. She also recently cast two seasons the Cinemax series A GIRL’S GUIDE TO DEPRAVITY. Time: 1 p.m. – 4:30p.m.